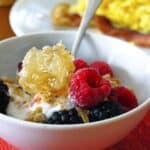 Layers of homemade granola, coconut whipped cream, fresh berries and Boston Honey Company pure honeycomb make for an easy and healthy, non-dairy breakfast. For those of you who aren’t in the hurricane path, I hope you’re having a calm Sunday morning that will be filled with coffee, snuggles and this Berry, Granola and Honeycomb Coconut Whipped Cream Parfait. This recipe isn’t going to blow your mind because it’s very similar to this Coconut Pomegranate Granola Parfait I made at the beginning of the year, but this has a very important addition: Boston Honey Company’s Comb Honey. 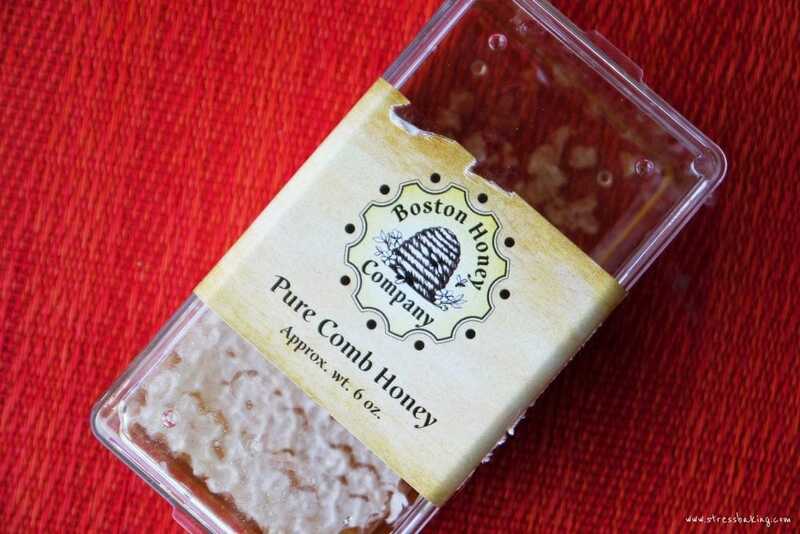 I’ve talked about Boston Honey Company frequently, but it’s for darn good reason – IT’S SO GOOD. They care so much about their family business, and the boyfriend and I love making a visit to Evan at the Boston Public Market to replenish our honey collection. 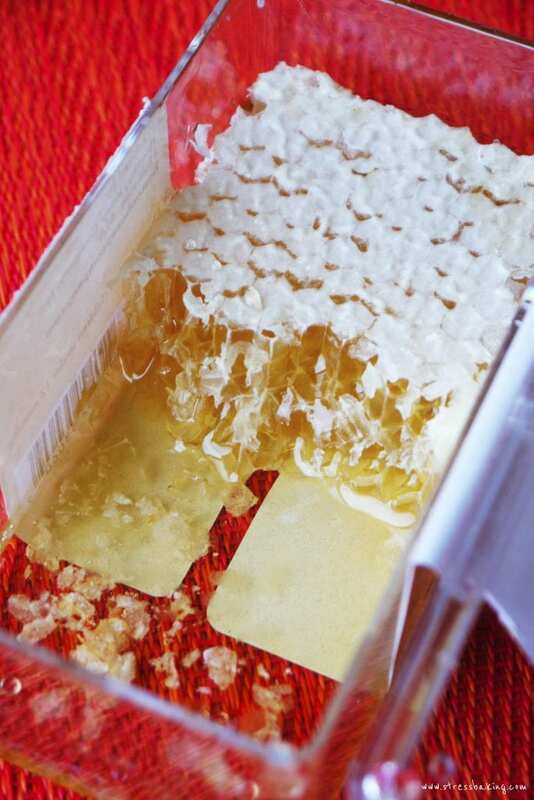 The most recent addition was their pure comb honey, and we got it without any idea of what we wanted to do with it. I almost never do that because everything needs a specific purpose so that I know I’m not wasting money. But this? It just looked so freaking amazing that we couldn’t pass it up. Thankfully, I quickly figured out what I wanted to do with it (you may see some more recipes featuring this little golden magic soon) and this was one of those things. It’s crazy good when you add it to a mixture of granola and berries, and it is the perfect complement to the coconut whipped cream. I didn’t need to add any sweetener to my whipped cream because the granola and honey gave it just the right amount of sweetness. Plus, the balance between my sweet parfait and savory bacon and eggs was heavenly – I highly recommend it. Now go forth and take a picture of your own parfait and tag it with #stressbaking on Instagram so I can check it out! ???? A great parfait substitute for non-yogurt lovers! Layers of homemade granola, coconut whipped cream, fresh berries and pure honeycomb make for an easy and healthy, non-dairy breakfast. Preheat oven to 300°F and prepare a baking sheet with non stick silicon mats or parchment paper. Spray with non-stick spay and set aside. In a small microwavable bowl, combine coconut oil and honey/maple syrup and heat for 30 seconds. Stir to combine. In a large bowl, combine the coconut oil mixture and oats and stir to combine. Pour onto baking sheet and spread in an even layer. Bake for 25-30 minutes, or until granola has started to turn a golden brown. Remove from oven and let cool on baking sheet. Once granola has cooled, transfer to a bowl and toss with chocolate to combine. Set aside. Remove the thick and condensed coconut cream from the can (save the liquid to use for something else!) and transfer to a mixing bowl. Using a whisk attachment, beat on medium high speed until soft peaks form. If you’d prefer a sweeter and less coconut-y taste, add vanilla bean paste or extract and/or powdered sugar and whip again. Set aside. 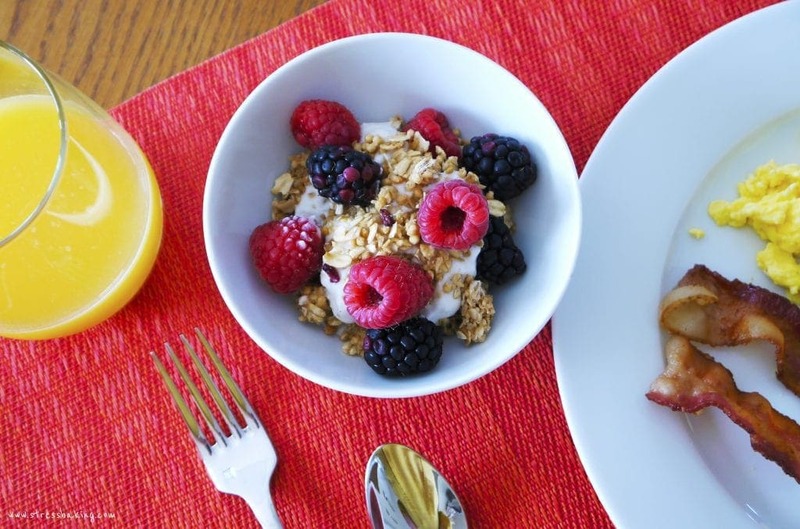 In a glass or bowl, add ¼ cup granola. Top with ¼ cup of coconut whipped cream, and then ¼ cup berries. Repeat one more time, top with a spoonful of honeycomb and enjoy! Don’t care about the presentation? 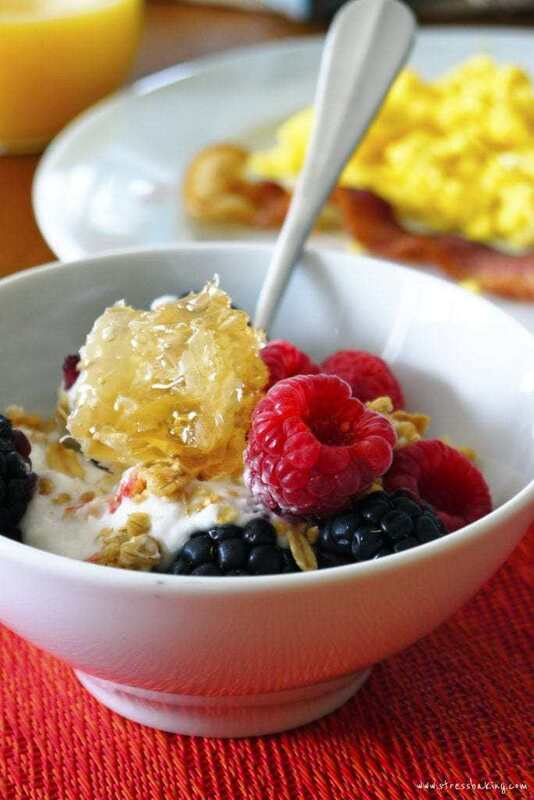 Just spoon the whipped cream into a bowl, pour granola on top and add berries and honeycomb! Disclaimer: This is not sponsored by Boston Honey Company, I just truly love their products!